An Environmental Impact Assessment has been carried out and accompanies the planning application. Such analysis will help to avoid damage to local plant life, birds, and protected species. In this way we can ensure that Hendy Wind Farm is sympathetically designed in the best interests of wildlife. 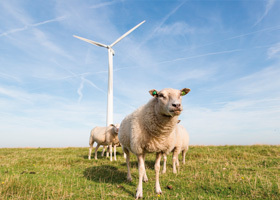 Wind turbines do not produce excessive noise and Hendy Wind Farm Ltd will meet all noise guidelines put in place by planning authorities, the layout of the turbines has been designed to ensure the minimum disruption to local residents. The visibility of the site from nearby residential properties and localities was considered carefully before selecting the site. The image to the right shows where the turbines could be seen from. Energy production: Hendy Wind Farm will provide enough wind power annually to fuel 9,800 homes. Pollution and waste: Wind power is a clean form of energy that produces no pollution or waste from spent fuels. 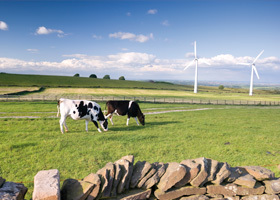 Wildlife: Concerns regarding wildlife are always considered when building a wind farm. We have carried out extensive surveys and avoided sensitive areas, in particular the foraging routes of bats and breeding grounds of birds. Helping the UK meet green targets: By 2020, the United Kingdom is committed to sourcing 15% of its energy needs from renewable energy*. 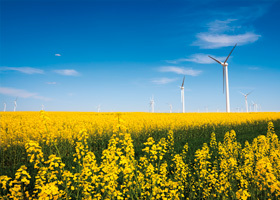 Whilst the UK is currently meeting its milestones, with almost 4% of UK energy now coming from renewable sources, further means of producing renewable energy are needed to enable the country to meet its targets**. Tourism: It is not true to say that wind farms affect tourism. In fact a study commissioned by Visit Scotland found that 80% of people living in the UK said a wind farm would not affect their decision about where to take a holiday***.